Sweet blueberries & juicy peaches make for the perfect summer dessert. 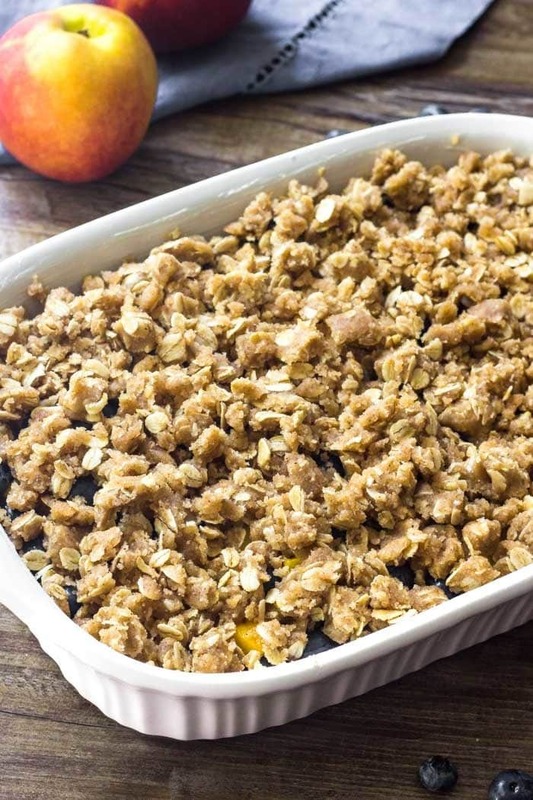 With brown sugar oatmeal topping – everyone goes crazy over this blueberry peach crumble. Fruit crumbles are crips just might be the perfect desserts for summer. They’re easy, no fuss and the perfect way to showcase fresh produce. 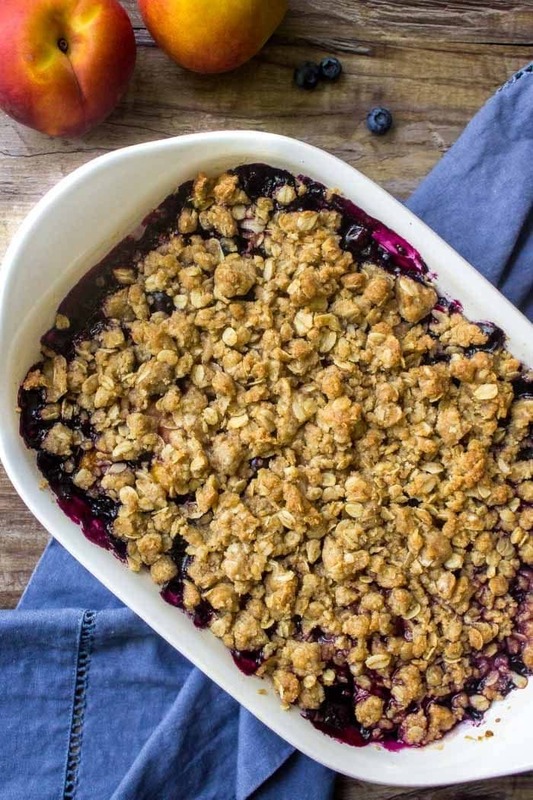 So today – we’re making blueberry peach crumble that features not one – but two summer fruits. 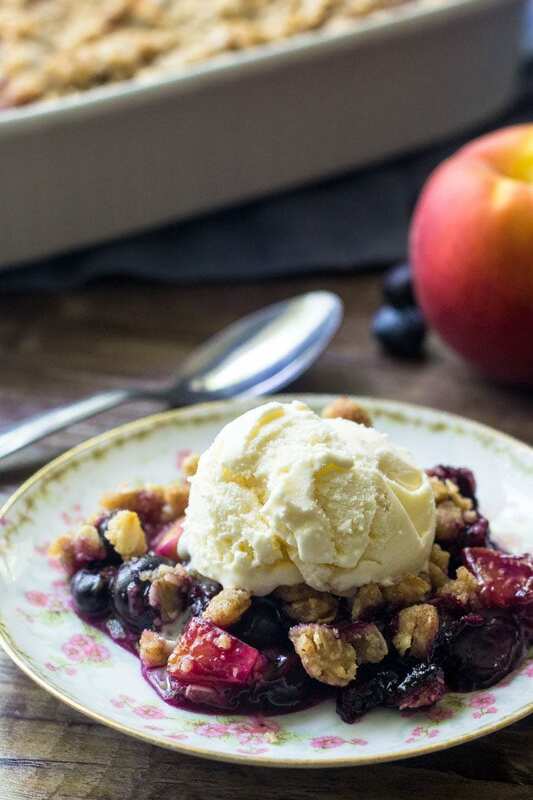 Making this blueberry peach crumble is super easy. First we make the fruit filling by tossing together the blueberries, peaches, sugar, cornstarch and a little lemon juice. 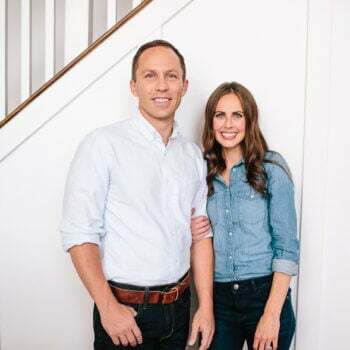 The lemon juice helps to bring out the fruit juices (don’t worry – you won’t taste lemon at all) and when eating a fruit pie you definitely want to really enjoy all of that fruit flavor. Don’t you hate when fruit filling is soupy? It’s the worst as you’re so excited to get eating and then bam, it all comes pouring our like fruit juice. There’s an easy fix, cornstarch ensures that the fruit isn’t too soupy. You just have to make sure that you whisk it in properly so it’s not clumpy. Then it’s time to make the oatmeal crumble. First toss together flour, white sugar, brown sugar, large flake oats, cinnamon, and a little salt. 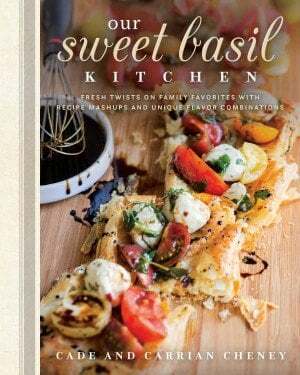 The brown sugar and cinnamon add so much flavor, and the oats create such delicious texture. You definitely want texture in a crumble, otherwise it’s really just a cobbler and that’s a whole different recipe. Finally, stir in the melted butter. The texture will feel like wet sand, and if you crumble it in your hand it should form chunks/crumbles. Here’s what it looks like before going into the oven. That topping is one of my favorite things ever. The whole thing bakes in the oven, and when it’s done the top should look golden and you’ll see bubbling berries starting to come through underneath. When they’re in season, I always use fresh blueberries and fresh peaches. Fresh fruit truly has better flavor and composition in the fruit filling, so as much as I hate to do this to you… use fresh fruit as much as you can. Can You Use Frozen Fruit in Fruit Pie Filling? Frozen fruit is not out of the picture. 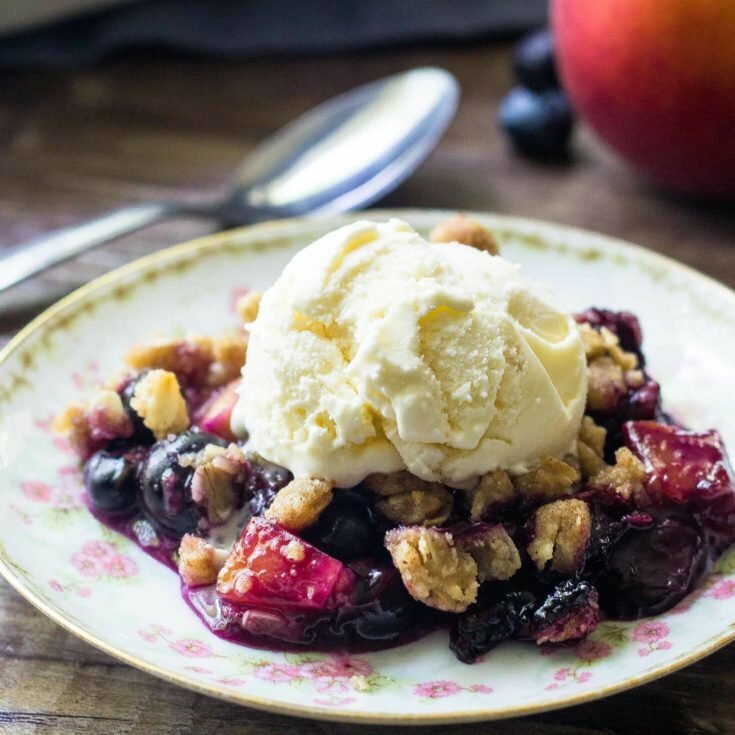 A Blueberry Peach Crumble turns out wonderful with with frozen berries. Frozen berries and frozen peaches work too (just make sure they aren’t packed in sugar). If you’re using frozen fruit, I recommend reducing the amount of lemon juice to 1/2 of a lemon. Actually, the best frozen fruit to use is if you freeze it yourself. You can read how we freeze fruit in our post on, How to Freeze Fruit for Better Smoothies. Can You Use Canned Fruit for Fruit Filling? You can also use canned peaches too, just make sure you’re only adding the peaches and not using the juice/syrup that they’re packed in. Otherwise, the fruit will be too liquidy, and remember how we are trying to avoid that? What Kind of Oats Should I Use? In fruit crumbles, I always recommend using old-fashioned or large flake oats. Quick oats work, but I find that they don’t have quite enough texture that I like. I do not recommend using instant oats because they behave more like flour instead of oats. I also definitely don’t recommend using steel cut oats. Because steel-cut oats aren’t rolled they end up hard and crunchy and don’t absorb any of the moisture that you need them to. It just turns out weird. 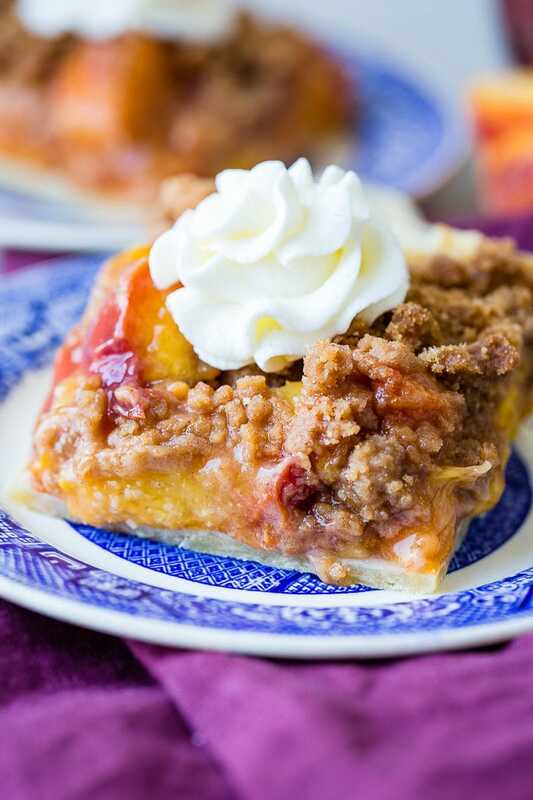 This blueberry peach crumble is such a delicious way to enjoy summer fruit. 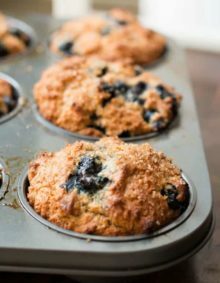 The blueberries & peaches are the stars of the show, and you’ll love the crunchy oatmeal cinnamon crumble. Sweet blueberries & juicy peaches make for the perfect summer dessert. 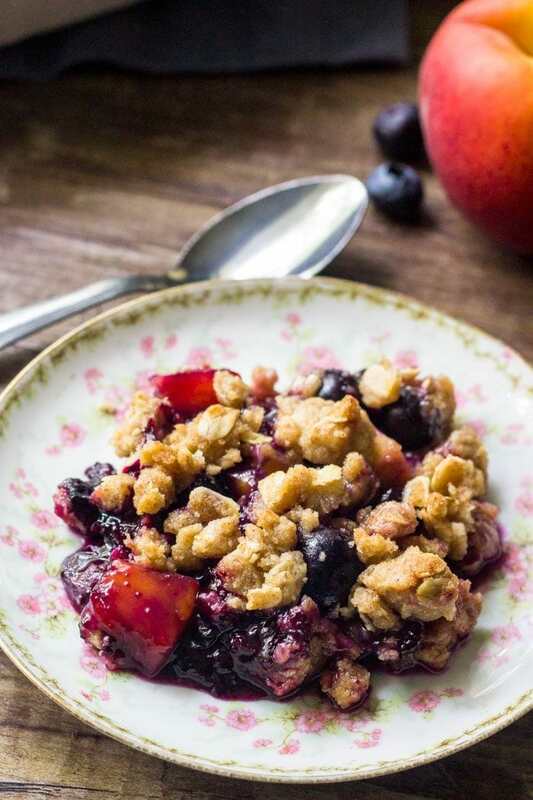 With brown sugar oatmeal topping - everyone goes crazy over this blueberry peach crumble. Preheat the oven to 350F degrees. Grease a 2 quart dish (I used an 11x7 casserole pan). 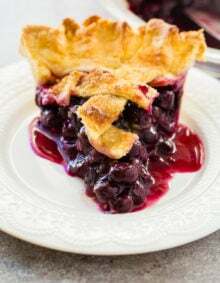 Make the blueberry peach layer by tossing together the blueberries, peaches, sugar, lemon juice and cornstarch. Pour the mixture into the casserole dish. Make sure to add in all of the juices & sugar left in the bottom of the bowl. To make the oatmeal crumble stir together the flour, oats, white sugar, brown sugar, cinnamon and salt. Stir in the melted butter until the mixture resembles wet sand. Crumble the oatmeal mixture over top of the fruit by squeezing it in your palm so that chunks/crumbles form. Bake in the oven for 30-40 minutes, or until you see the top getting golden brown and the fruit bubbling underneath. *Store leftovers in the fridge. 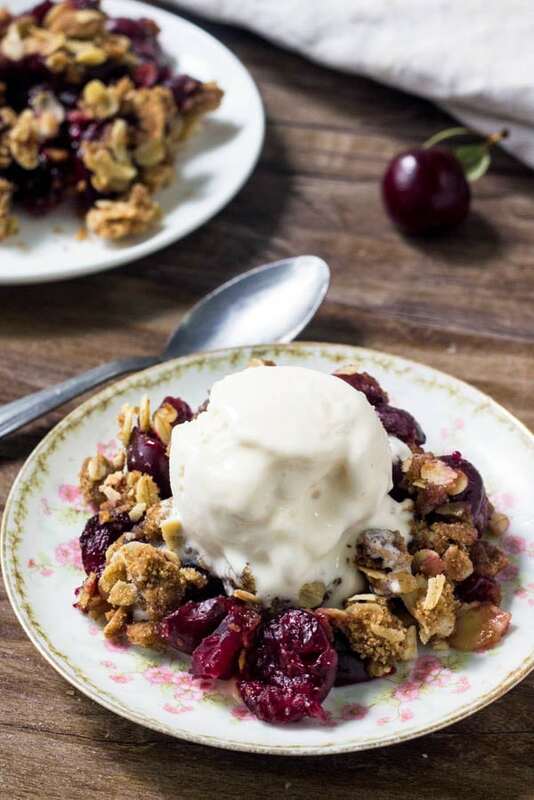 This fresh cherry crisp has an almond oatmeal crumble topping and so many juicy berries. 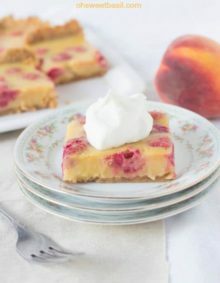 Brown sugar peach pie bars are way easier than making pie and filled with juicy berries. If you use frozen fruit, do you have to let it defrost to room temperature? Or can it still be a little cold?